Are you someone who loves sharing his ideas? Let’s assume you have done everything right – from blogging to collecting emails and giving back to the people through your content. Everyone loves your work and are eagerly waiting for you to announce a book, maybe a product or just something they can purchase! 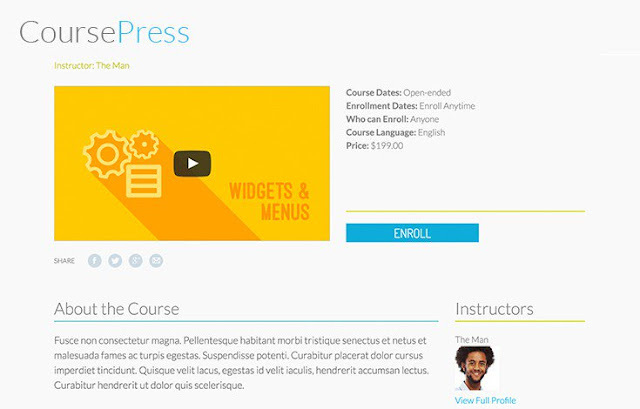 You can easily do this by creating an online course by using WordPress, without putting too big a hole in your pocket. Using WordPress is easy as well! Anyone who wants to create an online course for any purpose whatsoever can make use of WordPress plugins. Like everything in the world, they too come with their pros and cons. So, let’s take a look at some of the best WordPress Plugins in the tech market. If you are looking to sell a course on its own website, this is the one to go with.Featuring an offer launch for windows, universal login for various courses, a crisp and easy interface, and content drip delivery, Zippy Courses is definitely a fantastic choice! Its widgets also make course navigation a piece of cake. In addition, Zippy Courses now feature its own social triggers theme, which is a bonus if you are not a designer. Kudos! This is an independent solution, requiring no other plugins. Seamlessly runs more than one course per site. It requires its own site and cannot be part of a larger one. Does not support certificates or coupons yet. Does not support a random selection of quiz questions. Integrations– PayPal, MailChimp, Stripe, and Infusionsoft. LifterLMS is hands-down one of the best plugins for WordPress! With a built-in payment process, membership options, and gamification, it works well as a stand-alone plugin but can also be put on another site with contents in it. LifterLMS gives you plenty of flexibility since it does not require a site of its own; you can easily install it on the same site as your blog. As a bonus, it also has an extension for InfusionSoft as well! Yay! Supports course scheduling as well as prerequisites. 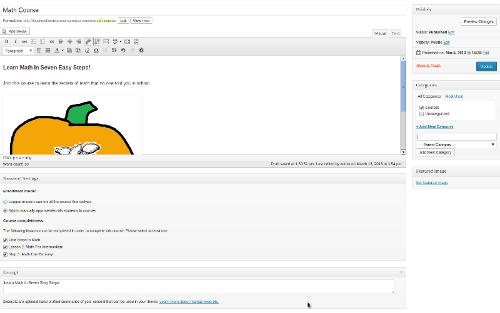 Has BuddyPress support and WooCommerce integration as well! Incorrect metabox placement issue, almost missing the drip feature. No random questions though question banks are supported. Integrations – Add-on integrations with PayPal, Stripe, WooCommerce,Ontraport, and others. If you are serious about creating an online course, have the time to learn and want all the features without any tweaking,LearnDash is the one of the best options for you. It is seriously powerful with a ton of features. For example , it is a plugin that is totally capable of integrating with WooCommerce, iThemes Exchange or EDD for payment methods. Need I say more? Let us see the other features mentioned in the Pros section. Has everything, including certificates and quizzes. Choice of lesson dripping and/or scheduling. Supports assigned homework and allow instructors to review uploaded assignments as well. Compulsory timer before any lesson can be marked as complete. Takes time to learn all its features. Customizing features is not easy for developers. Integrations – BuddyPress, WooCommerce, Stripe, and others. As if Rainmaker was not amazing enough, CopyBlogger introduced a new Rainmaker platform that snow supports online courses and lessons as well! If you want a plugin to do everything instead of making your site a DIY project, try this one! Rainmaker packs all the features to help you create a wonderful online course and provides beautiful landing pages to sell all your courses as well! If you are already a Rainmaker member, no other integration is required. Included in the plan, so no plugin is needed. Helps you treat your customers as a whole – from members to students. It is just the first version, so be ready for issues and bugs. There is still no clue about the release of its full list of features. Integration – WooCommerce, BuddyPress, Ontraport, and others. WP Courseware is a plugin that gives the best of both worlds. It can be used by a beginner, who is about to create his first online course and can also fulfil the desire of a developer to jump in and tweak some of the features! It comes packed with tons of features for creating small as well as large online courses, and each course can have several modules, units, and quiz banks. Supporting content drip features and pre-requisites, and promising the ease of usability and ability of tweaking features, this is definitely a plugin worth trying! Go ahead! Works well with other plugins on your site. Supports certificates and quiz timers. Has integration with memberships and eCommerce plugins as well. Uploading assignments are not very robust. Lesson times are not available. To drip lessons, a membership plugin is required. Created by the folks of WooCommerce, Sensei is a powerful WordPress plugin that is easy to use and flexible. Course creation is very easy with this plugin, that also allows you to run quizzes and assignments, and grade them as well.A feature-rich plugin, Woothemes Sensei is easy to use and is definitely a good choice as it now has the ability to drip course content. Has a quiz bank, supporting random questions. Includes course analytics, unlike other plugins. Allows certificates and badges for students. No timers for quiz questions and lessons. Assignment uploads are not robust here as well. Integrations – It integrates with WooCommerce plugins for membership. A free plugin, LearnPresscomes without a setup wizard, which means that you can set it up in a way you want. Convenient, right? LearnPress has several free and paid add-ons, allowing you to extend its features. It also has prerequisites, certificates, and quizzes as well, making it a must-try plugin for all! Course creation process is easy via lessons, questions, etc. Initial setup is difficult for beginners. Integrations – PayPal, Stripe, WooCommerce, and others. Cost – Free with paid add-ons. Another free-to-use plugin, CoursePress Pro offers online marketing and creating courses in an efficient way. A plugin with easy-to-setup courses, grading and reporting, this is a treat for beginners who are looking to open their first online course. With wonderful features and high efficiency, CoursePress Pro is definitely worth a try. Supports quizzes, certificates and automated assessments. Assignment uploads are not up to the mark. Integrations – PayPal, WooCommerce, and MarketPress. A new-comer in the world of plugins, Namaste LMS is a promising plugin, giving you benefits of a system of grading points for students, as well as a gradebook. Online course creation is easy as well, with easy-to-use features. Due to its consistent nature, this plugin has received a lot of great reviews and is widely used by many professionals also. Supports a grading points system and Gradebooks! Shopping cart and coupons are only available when one upgrades to Namaste! Pro. Integrations – Watu for creating tests; Stripe and PayPal for payments. As the name itself suggests, this plugin is very lucid and user-friendly. Just like other plugins, it also offers the usual like quiz banks and certificates, but an added feature is course outlining, making the task easier for students. You could definitely give this a try if you are looking for something easy-to-go and a little different. It comes with a time-limited course access. Integrations – BuddyPress, PayPal, and WooCommerce. This is a plugin that is loaded with features! From course sales pages to analytics and gamification, it is bound to satisfy all your WordPress needs. WorldClass aims at making online course creation easier. Add to that, it is a plugin that has its own mobile app! Go ahead and try it! Supports social logins and single sign-on. 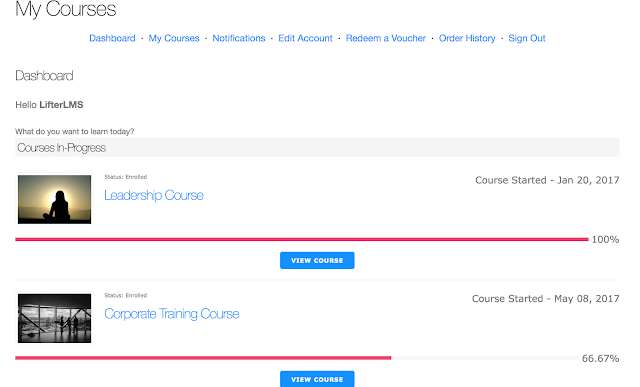 Enables course sales pages and has memberships. Can be expensive, depending upon usage. Integrations – PayPal, MailChimp, Stripe, and others. Cost - $0 to $455 per month. As the last plugin for this list, I would like to mention WPLMS, also a newcomer plugin but is equipped with good features. Along with course sales pages, it also offers you a messaging system, besides the usual features of all plugins. This will allow you to communicate with your students and anyone with any queries. This is worth a try too, as its messaging system is a major plus-point. Supports quizzes, examinations, and assignments. Supports a course sales pages system and certificates. No other integration other than PayPal is supported. All these plugins are not ordered in any way, none of them are superior to the other but each of them has many things to offer you. Thus, if you are a budding online course creator, go through this list of plugins and choose the one that suits you best! See we have shared the positive and negative factors of the plugins now it is your choice which feature suit you and your topic you want to teach. Many plugins have certificate issuing options after the completion of the course. Many have Progress tracker which will track the progress of the student. If you are a beginner and you don't know how to use this plugins then try the free or trail versions after knowing properly you can go with premium versions. Try the most affordable plugin and most featured plugin. Before choosing plugin see whether the author updating the plugins at right intervals of time. What type of course you are thinking to create? Have you already created an online course ? Please share your thoughts in the comments below. If you see any plugin does not deserve to be in the list then please share your valuable feedback with reasons. That's It Thanks For Following our Tutorial '' 18 Most Valuable Google Chrome Extensions Every Blogger Must Have'' Along With us If you found any difficulty Please Comment and Share Your Valuable Opinion. And Stay tuned for More Tutorials Like This and Share this with your friends.